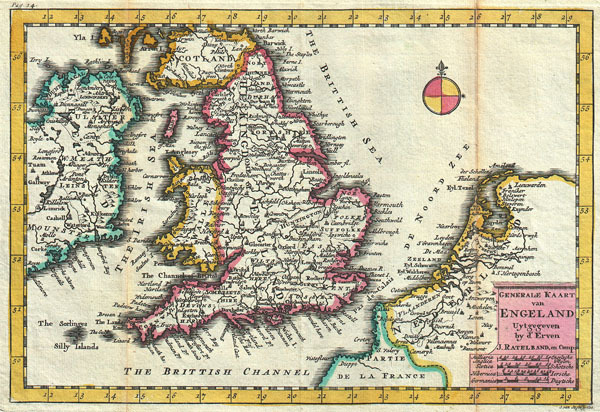 A stunning map of England first drawn by Daniel de la Feuille in 1706. Depicts the entirety of England with parts of Ireland, Scotland and the Netherlands. Dutch language title in lower right quadrant. This is Paul de la Feuille's 1747 reissue of his father Daniel's 1706 map. The De La Feuille name has been removed from the map and replaced with Ratelband's. Note in the bottom right quadrant dates this engraving to 1734 and attributes it to J. van Jagen, a prominent Dutch engraver. It was most likely Jagen who re-engraved and updated De La Feuille's map per Ratelband's instruction. Prepared for issue as plate no. 16 in J. Ratelband's 1747 Geographisch-Toneel. Jan van Jagen (1709 - 1800) and Carl van Jagen were active engravers based in Amsterdam. The Jagens were active throughout the 18th century and are known to have engraved maps for such prominent Dutch firms as Ottens, De La Feuille and Ratelband. Despite a fairly large corpus of work, little else is known of these elusive figures.